It all started with an advanced copy of a government report on the 2010 Upper Big Branch Mine disaster that killed 29 miners in southern West Virginia. “We knew that some other news organizations also had it, and we were thinking, ‘What can we do that’s different, that’s not going to be the same as what they did?’ says Chris Hamby, who was then a reporter working with the Center for Public Integrity. Then, Hamby found that in the Governor’s Task Force’s hundred-plus-page document, there was one page describing autopsies on 24 of the 29 men who died. The findings: 17 had signs of black lung. That launched Hamby on a reporting quest throughout West Virginia, southwestern Virginia, eastern Kentucky, and the rest of central Appalachia, investigating the resurgence of the disease. What came out of that year-long journey was “Breathless and Burdened,” a multi-part series that highlighted not only the resurgence of black lung, but a system that makes it nearly impossible for miners to claim their benefits once they’re stricken with the disease. 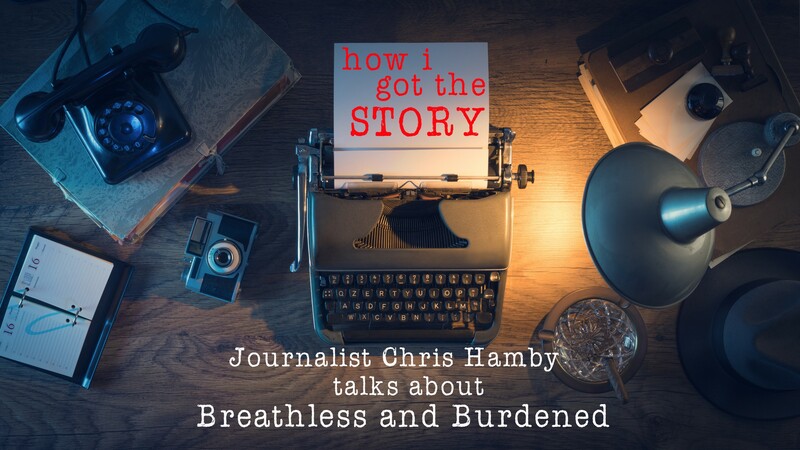 Here, Hamby breaks down how he reported the series, which won the 2014 Pulitzer Prize in Investigative Journalism. In the first part of this series, Hamby chronicles the fight of Gary Fox, a miner stricken with black lung, and his lawyer, John Cline, against the seedy practices of Jackson Kelly PLLC, a law firm that serves the coal industry and which, Hamby uncovered, consistently withheld information proving miners had black lung. “We’d been in touch with John Cline when we were there previously doing the story just about the resurgence of the disease because there really are almost no lawyers who practice in this field. He’s sort of a natural connection to miners who have the disease if you’re looking to talk to them. “It took anywhere from a few days to a couple weeks to go through an individual case, and then obviously those led to a lot of other reporting that I wanted to do to flesh out some of those details. In this second story, Hamby lays out a damning case against doctors at Johns Hopkins University who steadily testified for coal companies. These doctors, specifically Dr. Paul Wheeler, were hired by coal companies for upwards of $750 to read a single X-ray. But, according to Hamby’s reporting, they almost never found cases of black lung, resulting in lost suits by sick miners like Steve Day. “Fortunately, the Labor Department has a website where anything that’s reached the level of the administrative law judges — their file decisions are posted online, and actually in searchable PDFs. “It seemed like everybody knew he sort of had this bend toward coal companies. But when you can just say, ‘This is his record. The numbers don’t lie; this is what he did,’ there’s a certain power to that, even if it just sort of provides really concrete evidence to what some people suspected. “When Johns Hopkins refused to comment, there wasn’t a lot I could do other than to lay out everything for them in advance and say, ‘Here, this is what we have, what we’re going to say.’ You obviously don’t give them the story or anything, but we give them a lot of detailed information. This part of the series takes a deep dive into the history of how black lung is detected, and how the coal industry consistently denies and hampers efforts to change diagnostics. “To get the history, there were some really good books that sources had recommended I read. One that was really helpful to me was Penn State Professor of Labor History Alan Derickson’s book called Black Lung: Anatomy of a Public Health Disaster. That really details the shameful history of the industry and the medical professionals denying the existence of black lung in this country. This part of the series takes the reader inside a doctor’s office (specifically, one who has a history of siding with the coal industry) as he performs an exam to determine whether or not a miner has black lung. If you enjoyed this, and would like to see more content like it in the future, help support The Contently Foundation by making a donation today.